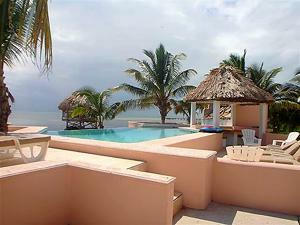 Casa Redonda Villa "Our Belize Vacation" - "Our Belize Vacation"
Casa Redonda is a luxury 8 bedroom, 5 bath villa located on the beach adjacent to Hol Chan Marine Reserve with a gorgeous view of the Caribbean Sea and Barrier Reef. This private home has 2 floors. 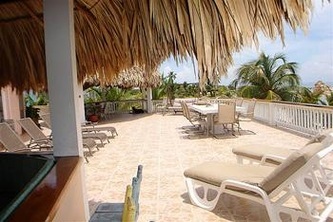 On the second floor the main villa is 4,300 square feet including a veranda which is 1,800 square feet. We can accommodate up to eight guests comfortably on this level. Casa Redonda is a round house with sliding glass doors and picture windows in each room which creates a lovely cross breeze. There are ceiling fans throughout and the ceilings are made of beautiful hardwoods of Belize (Mahogany, Rosewood, Sierra Cote, and Santa Maria) and air conditioning in the bedrooms. The floors are tiled in each room with Spanish natural color tiles. On the beach level is a private four bedroom suite with a view of the sea and pool from every room. This space is fully equipped with another kitchen, dining area, living room, cable TV, DVD player, CD player, patio and BBQ. On this level each bedroom has a queen size bed. The dining area can seat 8 guests. 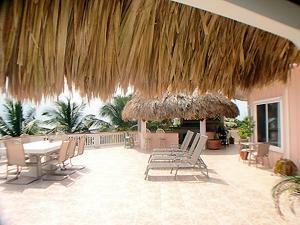 There is also a patio with lounge chairs and outdoor dining under a palapa. The veranda on the upper floor has a panoramic view of the beautiful turquoise sea and magnificent view of the reef. The outside living space on the veranda includes a breakfast area under a palapa. On the south side of the veranda is a bar under a palapa and seating area finished with handmade Mexican tile. There is a gas barbeque grill, and lounge chairs where you can sunbathe or relax under the stars in the evening. In the center of the veranda is a large dining room table with inlayed marble that can seat 10 guests. .. 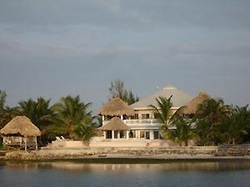 Located on the south back side is a Jacuzzi under a palapa for privacy and relaxation. Our new pool is exquisite with 2 sundecks and an infinity edge. The pool is 37’ x 18’ with the deepest part 6’ 6”. There are lounge chairs with cushions on the two pool decks and patio. The view while swimming, sunbathing or relaxing is incredible. The pier is 320 feet long. At the end of the pier you can swim in the sea which is 8-10 feet deep on the south side and shallow on the north side. You can also snorkel, sunbathe, fish or relax in the hammocks under the palapa. There are lounge chairs and we also have fishing rods which you may use. Any tours you may take the guide will pick you up and drop you off right at the end of the pier. There is an outdoor shower for your convenience when coming in from a swim or returning from any water sports. 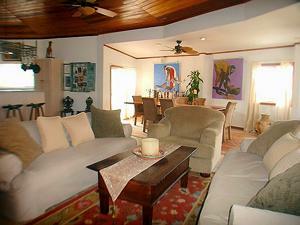 Eight (8) bedroom, 5 bath villa located 3.5 miles from San Pedro. This private home has 2 floors. 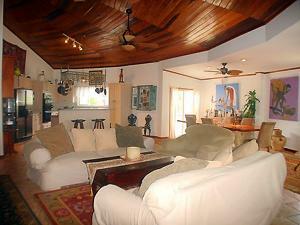 On the second floor the main villa is 4,300 square feet including a veranda which is 1,800 square feet. We can accommodate up to eight guests comfortably on this level. On the first level is a private four bedroom suite with a view of the sea and pool from every room. This space is fully equipped with another kitchen, dining area, living room, cable TV, DVD player, CD player, patio and BBQ. On this level each bedroom has a queen size bed. The dining area can seat 8 guests. There is also a patio with lounge chairs and outdoor dining under a palapa. The veranda on the upper floor has a panoramic view of the beautiful turquoise sea and magnificent view of the reef. The outside living space on the veranda includes a breakfast area under a palapa. The main living area, dining area, and kitchen are all in a giant open space for comfort and ease when relaxing with family and friends. There are large windows and sliding doors with a view of the sea. 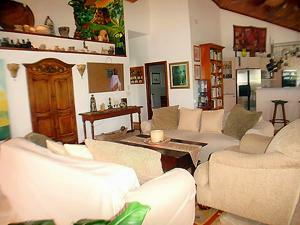 The living room features two large sofas and arm chair. Cable TV, CD player, DVD player. 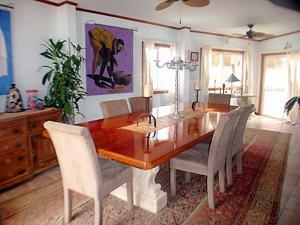 The dining area is spacious and seats eight guests very comfortably. The gourmet kitchen is fully equipped and features a central island with a six burner Wolf Range, large refrigerator with ice maker, microwave, built in oven, and a dishwasher. The counter tops are made of gray speckled corian and the cabinets are custom made of bleached oak. The Master bedroom has a king size bed. 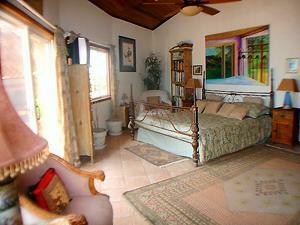 This room is very spacious with a panoramic view of the sea. There is a private bath with a bathtub and a separate shower. This room also has a large closet, seating area with antique chairs, cable TV and air conditioning. The second bath is located just outside the main living room. There is a full shower with tub. The second bedroom is located on the northeast corner of the house. 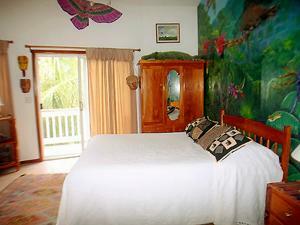 This spacious room features a mural of a jungle scene designed by a local artist and has a queen size bed. 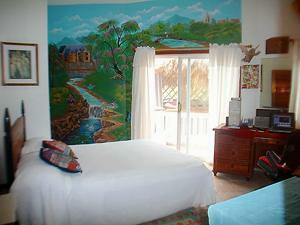 The third bedroom has a queen size bed and the wall is painted with a Fairy scene designed by a local artist. There is an adjoining bathroom between these two bedrooms which has double sinks on the outside and a private bathroom with shower and tub. The fourth bedroom is located on the south side of the house with 2 twin beds but also can be used as a queen bed when pushed together. This bedroom has a TV. All the bedrooms have air conditioning.